ConceptDraw MINDMAP with the new Quality MindMap solution is a perfect addition to quality visualization in your company. 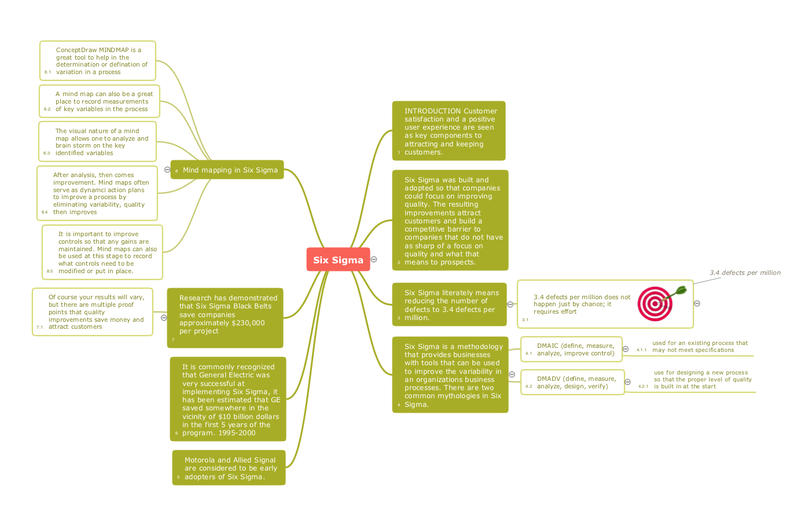 The mind map sample you see on this page were created in ConceptDraw MINDMAP as a demonstration of the creative approach to implementing quality management methods into daily work that Quality Mind Map solution offers. You can use these samples and templates to describe your own quality processes, brainstorm, and structure quality issues; then quickly present it to your team. Pic.1 Six sigma - Quality mindmap. This sample mind map is about Six sigma methodology of quality management, and about using mindmapping in Six sigma. The Internet is a huge world with unlimited possibilities. But with all its numerous advantages, the Internet also conceals many dangers and security threats, that's why we advise you to follow simple network security tips. ConceptDraw DIAGRAM v12 diagramming and vector drawing software supplied with Network Security Diagrams Solution from the Computer and Networks Area of ConceptDraw Solution Park is an ideal software for easy designing Network Security Diagrams and attractive illustrations with effective network security tips. Constant improvement of key performance indicators that are related to quality is a step in the right direction for a company interested in market growth. Lean Six Sigma (LSS) is a well-known in all over the world methodology of quality improvement and business perfection. ConceptDraw DIAGRAM v12 diagramming and vector drawing software is a powerful Lean Six Sigma Diagram Software thanks to the included Value Stream Mapping solution from the Quality Area of ConceptDraw Solution Park. Target Diagram is a convenient and visual way of presentation information which is popular and widely used in marketing, business and economics. ConceptDraw DIAGRAM v12 diagramming and vector drawing software extended with Target and Circular Diagrams solution from the Marketing area of ConceptDraw Solution Park is ideal for fast and easy drawing a Target Diagram.